All summer long, rumors have swirled around the future redevelopment of Coney Island, generating an atmosphere nearly as carnivalesque as the boardwalk itself: anonymous media reports of city officials’ intentions, tea-leaf readings of ambiguous signals, alarmist claims that Coney is shutting down. Change is coming, but it’s not yet clear in what form. Coney Island is New York City’s only C7 zone, a special amusement-park category that bans residences, restricts commercial uses, and limits Floor-Area Ratios to 2.0. However, developer Thor Equities saw massive potential for hotels, timeshares, and other new features in the area should the zoning change. Thor purchased 10 acres (over half the amusement zone), hired a design team, and started to float the plan to the public. They may have jumped the gun: The inevitable battles under the Uniform Land Use Review Procedure await the Department of City Planning’s revision of the C7 requirements, serially rescheduled and still under wraps. DCP press secretary Rachaele Raynoff said that no date has been set; Charles Reichenthal of the Coney Island Development Corporation (CIDC) and Community Board 13 anticipates an announcement by early September. The developer faces accusations of warehousing, flipping, Vegasification, and worse. Chief executive Joseph Sitt has evinced a talent for attracting opposition; speculation about his aims has overshadowed attention to the designs by Ehrenkrantz Eckstut & Kuhn (buildings) and Thinkwell (amusements). Since removing condos from his plan at a June 26 community meeting, Sitt has lowered his public profile. Thor representatives were unavailable for comment for this story. Citing historic assaults on Coney by Robert Moses, Fred Trump, and others, Zigun sees a classic battle between a speculator’s potential gain and civic resistance to homogenization of “the people’s paradise.” “It’s astonishing,” he said, “how developers still don’t realize it’s more sophisticated to mix old architecture that’s still worth preserving and rehabilitating together with new buildings, creating a sense of culture and continuity.” While working to preserve Coney’s freaky grit, CIDC member Zigun disavows any public position for or against Thor. All parties regard the “Coney Island’s last season” meme as mythical. Parks Department attendance estimates are around 14-15 million people per year, up from 3-5 milliontwodecades ago;most key businesses have no intention of closing. What may be in its final season is Astroland. Operator Carol Albert sold the property to Thor in 2006, leasing it back annually, but a 2008 renewal lease remains under negotiation. After listing her rides with Nashville-based amusement broker Ital International, she took them off the market in August; though the unmistakable Astrotower remains among Ital’s offerings at this writing, chief manager Carlo Guglielmi confirmed that sales of Astroland equipment are “suspended until further notice.” Albert’s representative Joseph Carella explained that Thor has informally given her a steep rent increase—roughly 15 times the current payment. There’s a rising star in the architecture and design communities. She can build homes so strong, they withstand more than 2,000 times their own weight. She taught Mercedes-Benz a thing or two about making more aerodynamic cars. And in her spare time, she developed a technique for creating vibrant colors with no toxins. So who is this superstar? You know her already—her name is Mother Nature. Time and again, she’s proven herself to be a master architect and engineer. (In case you’re wondering, tests have shown snail shells can support more than 2,000 times their weight, the streamlined form of the boxfish helped Mercedes-Benz build an ultrafuel-efficient car, and butterfly wings have their glorious color embedded in their structure.) We might feel humbled, but then again, nature’s been at this game a lot longer than we humans, honing her designs through the process of evolution. Scientists and technologists have been imitating nature for years to foster innovations in engineering. The strategy is known as “biomimicry” or “biomimetics, ”meaning “imitation of life.” Many architects and designers are catching on, reading Benyus’ book and others on the topic, and some are giving biomimicry a try themselves. Biomimicry can be applied at various levels: forms (biomorphism), functions, or entire ecosystems. In architecture, mimicking nature’s forms is one of the oldest tricks in the book. Consciously or not, builders of primitive huts echoed the form of a skeleton, crafting simple wood frames covered by animal skins. More modern architects, too, regularly develop their designs visually inspired by organic forms: the curves, tendrils, and floral shapes of Art Nouveau, the spiny spires of Gaudí, the structural vertibrae of Calatrava. Biomimicry gets more interesting, though, when it goes beyond form. “For us, it’s asking a deeper question of how the natural world does it: not what is the form but what is the function that that form provides,” says Dayna Baumeister, who helped found the Biomimicry Guild, along with Benyus. The group is devoted to biomimicry consulting, education, and research. Best of all, according to the guild, is biomimicry that echoes the workings of entire ecosystems, encompassing principles of adaptability, synergy, and efficient uses of limited resources. While the deeper forms of biomimicry have more to offer in terms of sustainability and functionality, they’re also more tricky to execute well. “It needs very careful thought,” says Julian Vincent, director of the Centrefor Biomimetic and Natural Technologies at the University of Bath. “When you’re looking at biological systems, they tend to solve problems in very different ways from engineering systems, which is why the area is so interesting. But that means that if you’re looking for an answer, you shouldn’t look for it in the most obvious place.” To even be able to formulate the right questions to ask and the right areas of nature to emulate, “you always need a biologist on hand,” he says. Despite its potential pitfalls, architectural biomimicry has resulted in some striking successes. The most famous example is the 1996 Eastgate building in Harare, Zimbabwe, which uses natural air conditioning modeled after the air flow in a termite mound. Designed by architect Mick Pearce with engineering by Arup, the office and retail building reportedly saved its owner $3.5 million in energy expenses in the first five years alone. Biologically obsessed architect Eugene Tsui once designed a house in Berkeley, California, with lighweight, strong trusses modeled after seagull bone marrow and a subsurface solar heating system based on the bone and capillary structures of two dinosaurs, the stegosaurus and the dimetrodon. Grimshaw Architects covered their Waterloo International Terminal in London with glass sheets that overlap like snake scales, to better hug the structure’s serpentine curves. Some biomimetic projects in the works show promise, too, such as Skidmore, Owings & Merrill’s spongelike design for the Pearl River Tower, a 71-story corporate headquarters. The design won a competition calling for sustainable design thanks to some unconventional thinking by Roger Frechette and his team in SOM’s performative design group. Frechette says they turned to the sea sponge for inspiration because “we found it doing a lot of things we look to buildings to do but without mechanical energy or electricity.” The squishy creatures are superbly engineered to harvest fuel from the sea: They can pump thousands of gallons of water a day, from which they draw their food. Sponges also shelter and protect a multitude of tiny inhabitants, which benefit from the flow of food-bearing water. So what do you get when you cross a highrise with a sponge? The design for the Pearl River Tower is porous, with four holes that house wind turbines to create electricity from the strong winds that blow above the ground. Defying convention, the tower faces the wind, to better harness its energy; the holes also relieve wind pressure. The building soaks up energy from the sun as well, thanks to strategically placed photovoltaic cells. With these and other energy-saving measures such as radiant cooling, the building’s energy use will be reduced by 58 to 60 percent. Frechette claims it will be by far the world’s most energy-efficient supertall tower when it’s completed in 2009. In another competition-winning design, landscape architects Grant Associates of Bath, England, designed a grove of “supertrees” as part of a larger future project to develop three parks around a Singapore marina. Reaching around 100 to 180 feet high, they are tree-shaped structures that will serve as homes for orchids and ferns, and shelter the humans below from rain and sun, as real trees do. The plants grow on and through the supertrees’ steel lattice skin. “Current computer analysis studies are investigating a structural design solution for the skin that reflects natural patterns of branching and cellular structures,” says Andrew Grant, director of Grant Associates. The supertrees also absorb solar energy in a way that’s analogous to their organic counterparts, since they support extensive arrays of photovoltaics and solar thermal panels, he says. Canopies collect rainwater, and the structures even have irrigation and misting systems that mirror natural transpiration. At night, the trees’ high-tech origins are revealed, for they transform into lanterns for the garden. Kevin Stack, president of Syracuse, New York–based Northeast Natural Homes and Northeast Green Building Consulting, exemplifies biomimicry on the grandest scale: emulating the intricate interworkings of ecosystems. His sustainable strategies recently helped him win the state’s first LEED-H Gold rating, for a residence in Skaneateles, New York. Stack has been in the sustainable home building business for nearly 30 years, and he recently became immersed in the concepts of biomimicry through reading Benyus’ book and studying at the Biomimicry Institute. He found the concepts eye-opening, especially the emphasis on studying and learning from the ecological systems of the local environment. After examining patterns of rainfall in upstate New York, he found that in an unbuilt area, 30 percent of rainfall goes into the aquifer, 30 percent is taken up by vegetation, and 40 percent evaporates. He now makes sure his buildings don’t disturb those natural proportions. Stack regards the trees that surround his construction sites as natural capital since they provide shade and oxygen and their roots help manage stormwater, so he treats them accordingly. “We actually hand-dig around their root system when we have to get close, and instead of just excavating roots out of the way, we’ll bend them by hand,” he explains. “If we have to cut a root, we cut it cleanly, and we apply a hormone that stimulates regrowth.” Instead of using materials that would have to be shipped in, such as bamboo, he chooses local ecofriendly materials such as recycled wood from old barns and PureBond, a type of plywood made from local hardwoods using a natural, nontoxic adhesive. Ok, fine, so New Yorkers may take a dim view of the intelligence of our West Coast brethren, but Ken Smith is taking it a little far. Smith is the landscape architect for the Orange County Great Park in Irvine, California, and he was apparently asked to come up with something snappy to mark the opening of the parks’s first phase, which was July 14. So what did he come up with? A fivestory- tall, 10,560-pound, bright orange helium balloon (which actually sounds kind of cool, since it can carry 30 people at a pop). But surely the symbolism is a little simple-minded, you think; an orange ball for Orange County? Wait, it gets better: “The balloon is an uplifting symbol…for all Orange County, and soon all the nation,” Smith declared in a press release. Balloon? Uplifting? You don’t say! Constant good weather doesn’t addle the brain that much. While we are firmly in the Groucho Marx camp regarding group activities—We wouldn’t join any club that would have us—we congratulate Peter Cook of Archigram fame and HOK on his new knighthood, which was conferred by Queen Elizabeth herself on June 16. But we’re a little worried that all of the Lordy-this Sir-that stuff is going to his head: We have it from a reliable source that he got a letter from Her Majesty’s garter king of Arms (which frankly sounds a little racy to our Yank ears) asking if he wants to bear arms, and he is considering taking said garter king of Arms up on the offer! In a country where even the coppers don’t carry guns! Note to members of the London Olympic Authority: It would be wise to approve his stadium design, and fast! We’ll reserve judgment on his skills as a painter, but Julian Schnabel is clearly a natural at real estate development. According to the New York Observer, the triplex unit atop Schabel’s newly enlarged and violently pink building on West 11th Street is for sale in the $50 million range, and Madonna is a serious potential buyer. U2’s Bono and The Edge were also spotted nosing around. $50 million? Hot pink? Just goes to show that the rich are indeed different from you and we. Several weeks ago, in one of the most unique planning exercises in recent city history, six leading design professionals donated their time to collaborate on a day-long charrette in a vacant storefront at United Nations Plaza. They produced a bold new vision for the redevelopment of Midtown Manhattan’s forlorn-looking East River waterfront. Most of the area that the designers focused on, between East 38th and East 42nd streets, is currently a no-man’s land that bears the imprint of a period in planning when cars were given priority over pedestrians. The dominant feature is a nine-acre development site where a Con Edison plant was once located in front of a massive elevated off-ramp from the FDR Drive. The charrette, which was held under the auspices of the Municipal Art Society (MAS), was an effort to harmonize the development agendas for four proposed projects: the United Nations expansion, the renovation of the FDR Drive, the extension of Manhattan’s greenway up the East Side, and the redevelopment of the Con Ed site. “We wanted to bring all the players together,” says Kent Barwick, president of the MAS. On the morning of the charrette, Midtown East stakeholders—including representatives from Manhattan CB6, the New York State Department of Transportation, the New York City Parks Department, and East Side Realty Company, which is redeveloping the Con Ed site with a master plan by Richard Meier and David Childs—made a presentation to the participating designers: Ricardo Scofidio of Diller Scofidio + Renfro, Kate Orff of Scape Studio, Margie Ruddick of WRT, Ken Smith of Ken Smith Landscape Architect, Brian Jencek of Hargreaves Associates, and Matthew Urbanski of Michael Van Valkenburgh Associates. This was actually the first time that their representatives, with the exception of the UN, discussed their objectives in the same room. In many ways the different visions presented appeared to be irreconcilable. For example, some of the stakeholders presented plans showing options for decking over FDR Drive to provide access to the East River. But for the DOT, there are major constraints against building a deck that slopes down to the river, most notably the FDR’s elevated 42nd Street exit ramp. The nexus of design currently hovers somewhere in the ether above The Netherlands, England, and Italy, and draws the occasional spark from Germany, France, and Belgium. This ferment is fueled by a group of youngish creative-types who work across borders, media, professions, and aesthetic sensibilities, intent on rethinking everything from the most prosaic bathroom tap to the production economies of small villages in India. Here’s a look at what’s on the minds and the drawing boards of a few of the key European designers who will be in NewYork during this year’s International Contemporary Furniture Fair. If Americans know one Dixon design, it is probably the Jack Light (1994), a stubby polyethylene lamp for the floor in the shape of play jacks and possessing considerably more oomph than a nostalgic Noguchi lantern. Lighting continues to figure largely in Dixon’s work, but he rarely sticks to one material, preferring “industrial experimentation” in substances ranging from copper to cast iron to foam. His 2007 theme is metal, but he has gone way beyond architecture’s stainless steel or fashion’s silver and gold. His Beat Lights are hammered brass, made with traditional methods in India, while the Copper Shades are plastic coated in vacuum- metallised copper. With her rapid speech and restless energy, architect-designer Patricia Urquiola is a natural fit for New York City. She is based in Milan, but recently spent some time here as she worked on designing her first American retail space, Moroso at Moss. An extension of the legendary Moss design store, the new boutique at 146 Prince Street showcases the furniture of Italian firm Moroso and the textiles of New York–based Maharam. During one visit a few weeks ago, Urquiola zipped around the still-raw 3,800- square-foot space, gesturing like a choreographer to indicate where mirrors, platforms, and other design elements must be to transform the former warehouse into an ultrastylish store and offices in time to open during the ICFF in late May. Best known for bold and uninhibited furniture, Urquiola is an architect with a keen awareness of space and a designer’s appreciation for beautiful forms, fabric, and patterns. At the new store, reflective and semireflective surfaces afford multiple perspectives on the furnishings and allow viewers to see themselves with the products. Four platforms of varying heights help create a sense of separation and order in the open space; an alcove showcases Maharam’s textiles and accessories. Color plays a central role in conceptualizing the store’s frequently changing decor, just as it’s a strong element in Moroso furniture. But beyond brand identity, Urquiola seems most concerned with honoring the individual visions of the designers whose works will be on display, such as Ross Lovegrove, Tord Boontje, Ron Arad,Tom Dixon, and Urquiola herself. She often speaks in poetic terms of her desire to help “tell the histories” of the creative talents. This is not Urquiola’s first crossdisciplinary venture. After studying architecture, she switched to design near the end of her studies at the Politecnico di Milano, inspired by her teacher Achille Castiglioni and others in Milan who were equally “in love with the big ‘A’ of architecture and the little ‘d’ of design,” she said. Since graduating in 1989, she has done everything from residential architecture and luxury interior design to booth and showroom design, though she’s perhaps most famous for her furniture designs for Moroso, Driade, Kartell, and other companies. In 2001 she founded her own firm, Studio Urquiola. Industrial designer Tord Boontje’s ascent was triggered by light and fairytales. In 2002, the British home retail chain Habitat commissioned Boontje to produce Garland, an affordable mass-produced light based on an early version of a limited edition design. Garland sold for about $30, and quickly became the It shade to dress a bare bulb. At the same time, the soft-spoken Dutchman made a splash with his Blossom chandelier for Swarovski, which was a sparkling branch covered with chunks of crystals unveiled during the 2002 Milan Furniture Fair. Two years later, Boontje was back in Milan with a showroom exhibition entitled Happy Ever After for the Italian furniture company Moroso. It was the culmination of work based on his ideas involving nature and technology, and crystallized the nascent trend in design towards the decorative. Boontje included prototypes and one-of-a-kind pieces: rocking chairs, tables, poufs, as well as his signature laser-cut fabrics upholstered on furniture and draped in loops from the ceiling. Designed in London with his longtime collaborator Graphic Thought Facility, the huge book takes the reader on a visual tour of Boontje’s career, starting with his early days in Holland at the Eindhoven Academy. There, he honed his skills in ceramics and textiles before going on to study at the Royal College of Art in London and eventually settling in the south of France with Emma Woffenden, his wife and design collaborator. Upcoming work in the studio includes a large architectural project in Shanghai with a spa and wellness center, and a design museum with shops and a restaurant. New products are also in the works for the Table Stories collection for Authentics as well as new lighting for Artecnica. Time will tell how far this latter-day William Morris hopes to go. Wiel Arets’ path to architecture and product design was an oblique one, to say the least. His early childhood interest in sports changed forever when the United States landed a man on the moon in the summer of 1969. “I was flabbergasted that we as human beings could put someone on the moon and drive a car there,” said Arets, the Maastrichtbased architect and designer. Spellbound by the space program, Arets began to study physics, but quickly decided that, while the subject was necessary to hurtle humans to extraterrestrial destinations, it was not for him. At the same time, he realized that if an astronaut were to drive a car on the moon, someone had to design that car in the first place. So Arets shifted his focus to architecture, and after graduating from the Technische Universiteit Eindhoven, he founded Wiel Arets Architects in 1984. From the very beginning of his architectural practice Arets designed products, primarily one-off custom jobs that attracted little attention. That all changed in 1994 with his Stealth office furniture line—a series of cabinets,benches,and conference tables that combined minimalist design with acoustic materials to provide sound-dampening in large, open-plan spaces. Designed for AZL Headquarters in Heerlen, the Netherlands, the line quickly garnered international attention and was picked up by the Dutch furniture maker Lensvelt in Breda. Three years later Italian design house Alessi—a company that has a long history of working with architects— contacted Arets, inviting him to design a coffee and tea service. Now he is involved in six projects with Alessi, including a watch called Watch.it, which was just introduced; a forthcoming espresso machine, and a line of bathroom fixtures, Il Bagno Alessi Dot, which will be on view at the AF New York showroom in September. For Arets, the difference between designing a building and an espresso cup is primarily a matter of scale—meters to millimeters. “As far as how I design, there is little difference between architecture and products,” he said. “I develop a concept and that leads me to the design.” His Alessi bathroom line is a prime example of this idea-to-form approach; the idea here, naturally, is water. “When a water drop falls on the floor you have a dot,” said Arets, “so I thought the circle should be the main design element.” From this simple concept, Arets decided to de-emphasize the materiality of his fixtures and focus attention on the fluid component by “chopping off” the steel spigots and ceramic pedestals and leaving simple basins with flat edges.These elegantly primitive forms with their exaggerated circle motifs make water the central feature. With a mantra like “Design is nothing, Life is everything,” it’s surprising that Jean-Marie Massaud is so sought-after right now on the corporate branding scene—he has designed stores for Lancôme worldwide, auto-show installations for Renault, and a makeover for the stolidly exquisite Italian furnituremaker Poltrona Frau. Then again, the 41-year old Paris-based designer (who has Jean Nouvel’s bare pate and Gerard Depardieu’s twinkle, and has done time in Philippe Starck’s studio) embodies an approach to design that is unabashedly sensual but environmentally aware and seems to be catching on. When Massaud edits a chair to almost nothing, he is not making an aesthetic statement so much as trying to use as few resources as possible. In addition to furniture for several leading Italian brands, including B&BItalia, Cassina, and Cappellini, his portfolio contains more than a few hypothetical projects; his favorite is an airship in the shape of a whale made for tourists in order to keep their footprints off the land. A seemingly improbable project in Guadalajara, Mexico, for a $120 million stadium in the shape of a grassy volcano with a floating sunscreen roof and berm-buried parking, may actually get built. Closer to home, the furniture Massaud presented in Milan this year was varied, but each piece played with the idea of collecting sensual experiences over objects— a very French response to rampant consumerism. His bath collection for Axor-Hansgrohe, introduced two years ago as a Water Dream complete with a Corian thundercloud swelling to burst over a luxurious sunken bath, is now in production. Surprisingly pragmatic, the Axor collection features a tap with water cascading from the lip of a 16-inch shelf, handy for shampoo or candles. In 2006, the molded mineral washbasin and faucet received the International Forum Product Design Award. The designer’s Heaven chair for EMU and the Ad Hoc outdoor chair for Viccarbe display the same hightech organic elasticity as Spider Man’s web. During the ICFF, the Ad Hoc will be shown in both black and white as part of an exhibition of new furniture from Europe at the just-opened Lepere Gallery on 20 West 22nd Street. Zaha Hadid’s forays into furniture design have become serious events ever since her Aqua Table sold at Phillips de Pury in 2005 for $296,000, a record for contemporary furniture at the time. In Milan last month, Hadid exhibited three new pieces for three different companies at very different scales and materials but all bearing remarkably similar DNA. Top to bottom: the 9.4-foot-long, vinyl-fabric-covered Moon system for B&B Italia; the 7-foot polyester resin Gyre with polyurethane lacquer in a limited edition of 12 for Established & Sons; and a sterling 27.5-inch silver bowl also in a numbered edition of 12 plus 3 artist’s proofs for Sawaya & Moroni. While the population boom and housing crisis have caused industrial zones in neighborhoods like Williamsburg and Long Island City to be transferred to residential uses, the city is also taking measures to preserve its manufacturing base. On March 28, the New York City Economic Development Corporation (EDC) announced an RFP for the acquisition and redevelopment of three buildings comprising 130,000 square feet at Bush Terminal in Sunset Park, Brooklyn, the 18-building, 6.5-million-square-foot industrial park completed by Irving Bush in 1895.The EDC is specifically seeking proposals from industrial businesses for employment- intensive uses such as manufacturing and fabrication. Proposals are due by May 21st. Currently the city rents space at the site on a month-to-month basis, a factor that, along with the building infrastructure’s dilapidation, has become a deterrent for businesses. One such company, Brisco— a silk screening shop that employed 100 people—packed up and moved to North Carolina. According to Rachael Dubin of the Southwest Brooklyn Industrial Development Corporation, Brisco left due to the leasing issue and because the site’s frequent power outages caused their machinery to break. The RFP requires developers wishing to acquire space at the terminal to seek at least LEED certification. Interested parties can submit proposals for the entire site or a minimum of 40,000 square feet, though no one scheme will be chosen without related plans that fill all three buildings. Previously, in summer 2006, the EDC issued a similar RFP for three other industrial loft buildings at Bush Terminal. Though the city has yet to announce the businesses that have been selected, the EDC determined to make a decision on the current RFP within six months. An 18-acre park has also been planned on a brownfield to the southwest of the site. The soon-to-open IAC/InterActiveCorp headquarters in New York is primarily being hailed as Frank Gehryys first building in the city, but it is so much more. Sited on the Far West Side in Chelsea, the ten-story billowing glass structure, which resembles a crystalline snow globe by day and a Creamsicle by night, is a flagship building for the booming Internet company.Yet it is also a catalyst to further development in the area that will sooner rather than later transform the neighborhood it was designed to complement. Right now, that neighborhood includes truck garages and storage warehouses, a womenns prison, and, lately, a few chic galleries. But they serve the IAC building well as a gritty brick backdrop against which its milky white slopes can swell and stand out. The setting that shows this dynamic gem off to best advantage is changing fast. Across narrow 19th Street, excavation is underway for Jean Nouvells 20- story condo that, in renderings, appears to be encrusted in giant mirrored Post-it notes. Immediately behind the Gehry building, 520 West Chelsea, an 11-story condo by Annabelle Selldorf, is rising with just enough space between the two, purportedly, to squeeze in a condo-cumgallery in the near future by Shigeru Ban. Other apartments by Robert A. M. Stern and Neil Denari are also in the works well within visual encroachment range. Such an embarrassment of riches makes one wonder if a new zoning rule stipulating only one icon per block ought to be put into effect. The IAC headquarters has a compact, dynamic scale that more than holds its own against the behemoth Chelsea Piers that stretches for blocks just across the West Side Highway. The tall-shipsat- full-sail metaphorran incredibly romantic conceit for jaded Manhattann that inspired the buildinggs form is experienced most immediately and effectively by the cars whizzing by on the adjacent highway, making the IAC the cityys first LA building. The pedestrian experience is less welcoming: sheer featureless walls on all three street sides with a slight bulge and no signage to speak, not even an easily discernible entrance. Apparently, Barry Diller, IACCs chairman and chief executive officer, was adamant that no signs should mar the structurees monolithic It-ness. Bruce Mau, hired to handle graphics throughout, has complied with an exceedingly diffident aluminum bar protuberanceea kind of anti-marqueeeover the main entrance, on 18th Street. In a January 11, 2006 article in The Wall Street Journal, Diller was quoted as saying he wanted a building that was a wondrous environmentt of its own. And so it comes as a surprise that the interiorssapart from a few very glitzy gesturesshave such a scattered look. The flashiest feature is the 118-footlong video wall in the lobby (one of two envisioned by Gehry and Mau and produced by McCann Systems, Trollbbck + Company, and Warren Z Productions) powered by 18 12,000-lumen projectors and streaming a collage of images of flowers, client product endorsements, and art projects. The video screen will be somewhere between advertising and art,, said Eric Levin, an associate director in the companyys real estate department, on a recent tour that included a stop behind the video wall to see a sound-andlight setup worthy of a Madonna tour. Up close, the glass surface has a busy, pulsating pattern. Clear across each middle section (at a point where people of average height might stand to look out), the glass then shades gradually to opaque white due to miniscule ceramic frit dots arranged in irregular waves that collect at their densest at top and bottom. This irregular wave patterning creates a striated look recalling a Xerox machine thatts running out of toner ink. The glass, like the building itself, seems intended for viewing from a distance. Studios Architecture designed the interiors on all the floors except the sixth, where the executive offices are located. The partnership with Gehry (who was responsible for the interior of the lobby and the sixth floor) is a compatible one, marked with a predilection for bright colors, lots of patterns, and shiny surfaces. 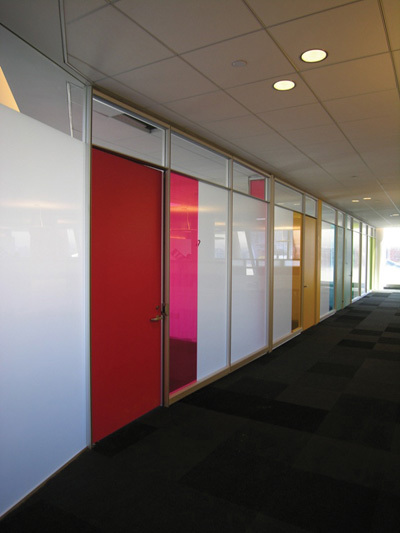 The glass partitions and doors leading to the private offices on nonexecutive floors are the color of Tropical Fruit Lifesavers. Austin Powersorange seating pods dot the floor, and supergraphics by Mau cover the elevator landing walls. Gehry installed a rug with a tiger-striped pattern in Dillerrs executive suite. It all screams Youth! Creativity! Energy!! which could become tiresome in the long run. Attempts at unifying the interior space fall flat. Each floor has a constant 8-foot wall that serves as a datum line to counteract ceiling heights that are the 91⁄2 feet on lower floors and the 101⁄2 feet on upper floors. A plenum below each floor slab is recessed from the angled facade, creating space for a constant 4-foot-deep perimeter cove light, which accounts for the buildinggs nighttime glow. A problem arises, however, at the messy juncture of cove edge, private office clerestory, and tilted facade. At the Ray and Maria Stata Center at MIT in Boston, which opened in 2004, Gehry was allowed more latitude in plugging things together with an ad-hoc haphazardness that comes across as vigorous and dynamic. Here, attempts to tame irregularities merely look slipshod and fussy. For instance, columns along the perimeter are planted parallel to the glass, meaning they tilt, some as much as 20 degrees. Meanwhile, interior columns are straight but not arranged in any particular rhythm. They align instead with the columns above and below on floor plates that are themselves rotated. Trying to impose visual order is a losing proposition here, and aesthetically counterproductive. Let creative impulses reign. If only the approach to the interiors had been executed with the same spirit of derring-do as the building itself, the IAC would be the wondrous object Diller intended. As is, passers-byybe they on foot or in a car, without much time to pick out detailssare the ones who can best enjoy its considerable thrill. 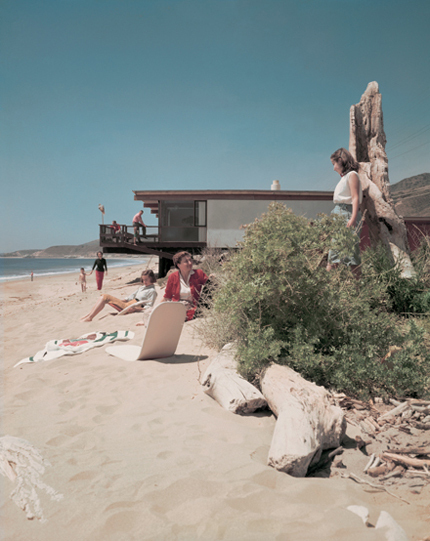 JULIE V. IOVINE IS AN'S ARCHITECTURE CRITIC. SHE CONTRIBUTES TO THE NEW YORK TIMES, ART & CULTURE, ART REVIEW (UK), DEPARTURES, AND OTHER PUBLICATIONS. Frank Gehryys designs have often challenged manufacturers and contractors to develop new systems. 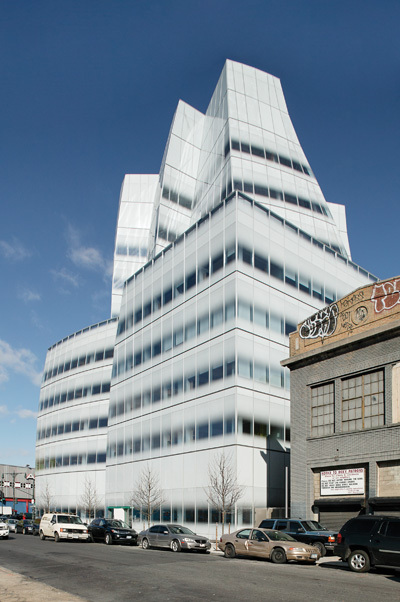 In the case of the IAC/ InterActiveCorp headquarterss curtain wall, Gehry Partners and building envelope engineer/manufacturer Permasteelisa collaborated using a centralized 3D computer model to accomplish everything from the design and fabrication of its panel shapes to the positioning of its anchoring system. Unlike a rectilinear building whose curtain wall units are by and large identical, skinning IAC required a variety of panel shapes to form a tight wrapper for the designns billowing sail-like forms. The designers determined the shape of each panel on the model and then fed this data directly into an automated fabrication process that cut the aluminum and glass. Of the 1,450 curtain wall units, 1,150 are unique. Permasteelisa manufactured the panels flat, but once on site, bent them into place, in a process called cold warping. Installers connected three corners of each unit first then manually forced the fourth into place, literally contorting the glass and metal and giving IAC itts curvy looks. This puts enormous stress on each panells perimeter seal, so to prepare the units for cold warping, Permasteelisa specially designed each silicon seal with the glass fabricator. This created an extremely rigid cladding system that required construction tolerances much smaller than most contractors are used to working within. According to Alberto Gobbi, president of Permasteelisa, the curtain wall had only 1⁄8 inch of flub room, whereas the concrete frame could be expected to vary an inch in any direction from the idealize model. 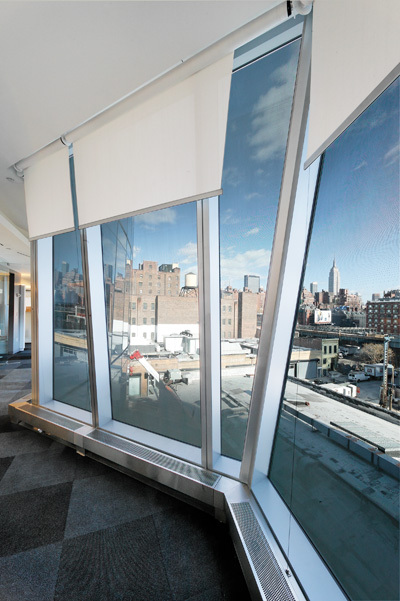 To address this issue, Permasteelisa designed a special anchoring system that could absorb tolerances between frame and curtain wall. 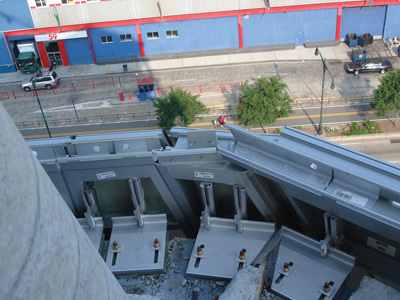 Composed of horizontal and vertical aluminum brackets, the anchors bolt to the slab edge and can slide three dimensionally until the connection point is reached. To find the connection point, Permasteelisaas survey team used the 3D model in conjunction with a GPS system and lasers to triangulate the exact location. This is Frank Gehryys first major glass building, and as it turns out, titanium and stainless steel are a lot easier to make conform to his signature curves than glass panels. 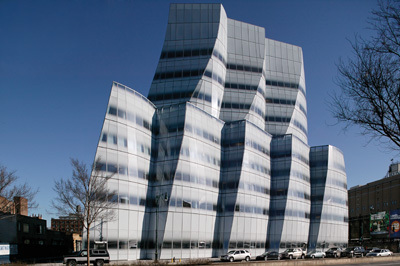 Although the solar shading company MechoShade had worked with Gehry Partners before on projects like Bard College Performing Arts Center in the Hudson Valley and the Walt Disney Concert Hall in Los Angeles, The IAC building literally presented us with a new twist,, said company vice president Glen Berman. More than three-quarters of the unitized glass panels that make up the IACCs cladding have a compound curve, so standard roller shades would never match both the window head and sill. In order to conform to the buildinggs irregular geometry, MechoShade (with the support of Studios Architecture) created more than one thousand customtwisted shades, all individually motorized. By modifying the systemms hardware, we were able to twist the shades up to 30 degrees, matching and exceeding the slight twist of IAC glass panels,, said Berman. We developed an innovative technology for these types of structures.. Berman hopes that the new system will be ready for market very shortly, because the IAC is clearly not the last building that will use twisted and torqued forms. Designing interiors to match a building by Frank Gehry can be a daunting task. 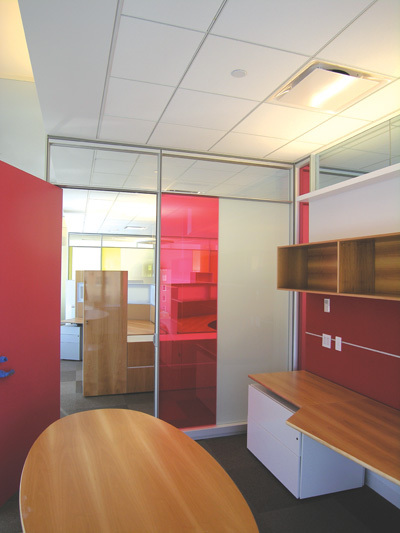 When DIRTT (Do It Right This Time) heard that much of the budget for the IAC building was devoted to the facade, and that the custom scheme by STUDIOS architecture (the firm in charge of the interiors) was prohibitively expensive, the 2-year-old Canadian company pitched its Stick-built modular wall system to the construction manager. The Stick Built walls not only conform to the irregular shapes dictated by Gehryys design and maintain STUDIOOs vibrant color scheme but they also fit the budget. It saved them a ton of money,, said Akua Lesesne. 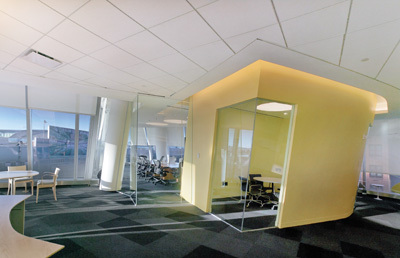 The savings stem from the modular nature of the walls, which are essentially a lattice of steel frames into which DIRTTTs or locally-sourced glass can be installed. Lesesne said that unlike custom work, the Stick-Built Walls eliminate the waste and time of cutting and disposing of glass on-site, or shipping it from the factory, both of which save time, money, and the environment. Corporate art is so passs: These days, video screens often adorn a businesss walls instead. IAC/InterActiveCorp has even gone so far as to make video an integral part of the design of its new headquarters. Motorists on the West Side Highway will catch an eyeful of the 118-foot-long video wall displayed in the buildinggs lobby like a huge indoor billboard. At night, the bright projections will be visible through the buildinggs glass facade. Prominent design firm Trollbbck + Company has created advertising for IAC brands such as Ask.com and Match.com for the wall, but this is just the beginning. By June, the programming will include a mix of projects from video artists, students, and even community organizations. While its sheer size and visibility make the west video wall the flashiest display in the building, itts far from the only one. On the east side of the lobby, a finely detailed image of Earth will shine on a 20-by-11-foot display surface. Using handheld touch screens, lobby visitors will be able to spin the high-res virtual globe to find the companyys offices around the world, get real-time statistics on Web traffic for IACCs many businesses, and launch live TV feeds from a company network. Warren Z and Tank Design helped to create the content for the interactive installation. Elsewhere around the building, staffers will use video for virtual collaboration.The headquarters is designed to be a gathering point for employees from around the world, and when people cannt make it to New York, video is the next best thing. The buildinggs eight office floors feature more than 20 meeting facilities outfitted with highdefinition videoconferencing equipment and large plasma smartboards devoted to video or the Web. Not surprisingly, the IAC had to enlist a full-time AV engineer to oversee the buildinggs videoconference equipment, video walls and other audiovisual systems, said Eric Levin, an associate director in IACCs real estate department. But the payoff is clear: For a company whose mission to promote interactive technologies, a high-tech ddcor is more than a luxury. The Greenpoint Manufacturing and Design Center (GMDC) has been restoring vacant factories in North Brooklyn for their intended uses since 1992, with the aim of sustaining the boroughhs vibrant manufacturing sector. After a few years of inactivity, the center has a new project underway near the Montrose L stop in Williamsburg as the result of financial support from various city agencies. The New York City Industrial Development Agency (IDA) announced on March 13 that it will extend tax benefits to the not-for-profit organization to help it acquire and renovate the 72,000-square-foot facility. In addition to $4.5 million pledged by the IDA, City Council has contributed $3.5 million, and the Brooklyn borough presidentts office will furnish another $500,000. The facility will support small and medium industrial companies, providing an estimated 125 jobssas many as are supported in all of GMDCCs five other projects, which together cover 770,000 square feet at sites in Greenpoint and East Williamsburg. Tenants have included architects, woodworkers, and apparel manufacturers, among others. Since restructuring in summer 2005, GMDC has expanded its focus beyond North Brooklyn; its first project to develop a factory for a company in the Bronx fell through, however, because it was less expensive to move to New Jersey. Itts been a difficult market for a not-for-profit group,, GMDC CEO Brian Coleman said. Real estate speculation and the Greenpoint/Williamsburg rezoning contributed to the absence of new GMDC projects, he said. Its last project was completed in 2001. It has persevered with the latest project, which Coleman said cost almost twice as much to acquire as its earlier ones. While the neighborhood around South Street Seaport is rapidly changing, the company that operates the mall there is taking its time to develop plans to connect the complex with the rest of Manhattan. The operator,General Growth Properties, hired Sharples Holden Pasquarelli (SHoP Architects) to develop a masterplan for making the Seaport more compelling to locals, citywide shoppers, and tourists. SHoP (along with the Richard Rogers Partnership) is also working for General Growthhs landlord, the city, to implement a plan that will turn the waterfront north of the Seaport into a major new park. The other major change that has made the area more attractive for development was the Fulton Fish Marketts 2005 move to Huntts Point in the Bronx. Pasquarelli told AN that his firmms work for both clients aims to make the South Street waterfront more accessible and further open its views to the Brooklyn Bridge..We have spent three years working with the community and are trying to make sure that any [mall] proposal complements and hopefully even solves some issues with the esplanade..He added that preserving the current three-story mall remains a distinct possibility. But some community residents worry that the private operator will try to cash in on the public improvements at South Street by creating a condo or a hotel.That was clear at General Growthhs scheduled February 27 presentation to a Seaport subcommittee of Community Board 1.While presenting the many concepts currently under study, Pasquarelli and others found themselves defending their work to the often hostile crowd of more than 100 people. Pasquarelliis presentation stressed Pier177s current disconnect from the street grid..You get to Fulton and Water [streets], and you cannt see the historic ships,, he said. The ideas he presented included restoring the rotting piers under the three idle Fish Market buildings and moving one, the 1907 Tin Building, to line up Beekman Street with waterfront access. But meeting attendees dwelled on a single slide that showed how shrinking the mallls footprint to create a slender tower would open more of the pier.Many charged that the operator secretly plans to sell condos without providing parks and schools. General Growth representative Michael McNaughton insisted that any redesign would enhance the community..This is the beginning of a process,, he said. Pasquarelli echoed this, saying that there were at least 25 plans under discussion, and many more months of design research. Many groups want to influence the process: Preservationists want to refurbish the South Street Seaport Museum and its historic vessels.And the Drawing Center, which was originally slated for the cultural institution lineup at Ground Zero, is one of many nonprofit organizations that have expressed interest in using the site. And New York City, as owner of the underlying piers,will scrutinize any decision on aesthetic and contextual grounds..The city would seek improved access to the waterfront and development that enhances the unique historic waterfront and important views,, said a city planning spokesperson. This means balancing residentss views with those available to visitors.